Please read the Pages and Add New Page sections before continuing with this section. · Next to the Bulk Actions menu there are two filter options that allow you view posts according to either date or category. Simply choose your desired option from the drop down menu and click on the Filter button. This is useful if you have many posts in the system and gives you greater control over your work area. · On the far right of the filter options there are two buttons allowing you to view posts in List View (the default setting) or Excerpt View. Excerpt View displays an excerpt of each post giving you more information about your content so you can make an accurate decision about the post you wish to edit. Next to it is the Total number of posts that you already created. · In the list of posts that are available to edit you will also notice two additional columns, Categories and Tags. These will be explained in greater detail later on. As in the Pages screen, clicking on the post title will take you to the Post screen as described in the next section. Clicking on the author will filter the posts in the list to posts written only by that author. Clicking on the category will filter the posts in the table to posts belonging only to that category. 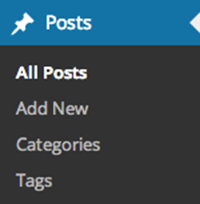 Clicking on a tag will filter the posts in the table to posts assigned that tag.